Modular Design allows us to make-to-order each winch to meet your exact needs. 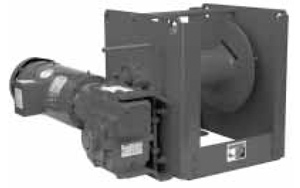 Standard Features include TEFC brake motors, enclosed machine cut gearing and flange style ball bearings. Custom Modifications available include grooved drums, special drum lengths and diameters, limit switches, roller pressure bars, and special finishes. Pneumatic, hydraulic and alternate motor voltages are also available. (in) Line Speed (fpm) Drum Cap. (ft) Appx. ‘ Actual drum capacities 25-30% less, due to nonuniform winding. Wire rope tension will also affect drum capacity. 2 Weight may vary with motor. Please contact factory or nearest Them n Distributor for firm fixed price and delivery. Custom controls are available including wireless remote control, variable speed control, electronic overload, and enclosures for special environments. Controls for 115V single phase motors up to 1 hp, include an 8 ft power cord with grounded plug. Please contact factory or nearest Them n Distributor for firm fixed price and delivery. ‘ Recommended minimum distance between drum and lead sheave for smooth drum. It is the owner’s or operator’s responsibility to determine the suitability of the equipment to its intended use. Study all applicable codes, manuals, and regulations. Be sure to read the Owner’s Manual supplied with the equipment before operating it.